"Southwestern Serbia" is not a standard geographical term - I have used it to refer to a variety of sites that could loosely be described as lying between Belgrade and Montenegro. Many people travel straight from Belgrade to the Montenegrin coast, but there are plenty of things to see along the way. The towns and cities of this region are functional rather than picturesque, but some of Serbia's loveliest monasteries are hidden away in the hills. The town of Kraljevo is not particularly interesting in itself. The architecture is entirely modern and its most notable feature is that its central square is a circle - I'm told that it functions as a giant sundial. The pedestrianised centre is quite pleasant and the town makes a good base for a visiting a number of places of interest, especially if you are relying on public transport. Žiča Monastery is located in Kraljevo's southern suburbs. The deep red colour of its walls gives it a very attractive appearance from outside, but its importance is mainly historical rather than artistic, as few of the original frescos remain. Ljubostinja Convent, west of Kraljevo, is one of the most picturesque monasteries when viewed from the outside (although again the interior has few remaining frescos). The exterior of the church is decorated with lots of appealing frills, and surrounded by beautifully tended gardens. Unlike suburban Žiča, Ljubostinja is located in a lovely wooded valley. There seem to be several walking trails in the surrounding hills - I would have explored further if I hadn't visited in pouring rain. Continuing westwards brings you to Kruševac, another largely modern city. The main attraction here is Prince Lazar's fortress. It is now a complete ruin, with not much left to see except some foundations - perhaps that's why the statue of the Prince looks so mournful. Fortunately Lazar's Church has survived. At first glance you might guess that the church is quite modern, but it dates from the 14th century. Like Ljubostinja it exhibits the elaborately carved doors and windows typical of the Morava School. Kraljevo is one of the best-connected towns south of Belgrade. It's easy to get a bus north to Belgrade (3 hours) or south to Novi Pazar (2 hours, sometimes with a change at Raška). There is a train station in Kraljevo but most services are very slow. It is possible to walk from the centre of Kraljevo to Žiča Monastery in 45 minutes, but as it's a dull and dusty trudge you might prefer to take a taxi or hop on a local bus heading to Mataruška Banja. Frequent buses and a few slow trains connect Kraljevo and Kruševac; all stop at Trstenik, from where you can walk 4km north to Ljubostinja on a quiet and pleasant road. Kruševac itself has good connections to Belgrade. Southbound buses from Kraljevo pass Maglić and the village of Ušće, from where much less frequent buses head 12km west to Studenica. Accommodation options in this area are limited, but Kraljevo and Kruševac each have a couple of hotels. The road south from Kraljevo brings you to the Raška region, sometimes known as the Sandžak of Novi Pazar (the term sandžak refers to an administrative region of the Ottoman Empire). This part of Serbia has a significant population of Muslims - they are Slavs rather than Albanians, in contrast to neighbouring Kosovo. The appearance of minarets on the skyline is the most immediately visible difference compared to the rest of Serbia, but there are many more subtle contrasts that give this area its distinctive atmosphere. 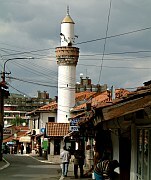 Novi Pazar is the largest town in the region. The centre of town appears to have been the scene of a violent battle between Ottoman and Socialist architecture. The oldest and most interesting buildings are in the old bazaar area south of the Raška River, where the Altum Alem Mosque has somehow survived since the 16h century. The town's name means "new market", and its trading tradition continues in a large open-air market to the north of the river. Despite the obvious Muslim presence, the surroundings of Novi Pazar contain several important Christian monuments. The Church of St Peter can be reached by walking north from the centre. Parts of the building date from the 8th century, making it the oldest church in Serbia. The weathered brickwork is very attractive, and the simple tombstones that surround the church look suitably ancient. The Đjurđevi Stupovi Monastery (The Pillars of St George) is clearly visible on a hill overlooking the town. There are several ways to get there on foot, but none is clearly marked; one path starts at St Peter's Church. If you persevere you should get there eventually - it's worth the effort just for the expansive views of the surrounding valleys. Most of the buildings are in ruins, but large plate glass windows have been installed to create a sheltered area in which services can be held - one was in progress when I visited. I suppose the windows might be justifiable on the grounds of maintaining the religious tradition, but from an aesthetic point of view they look terrible. The monks greeted me enthusiastically, and encouraged me to take photos of the few surviving frescos. I was quite surprised by this as most Serbian monasteries have a less than welcoming attitude to photographers. A stroll in the outskirts of Novi Pazar reveals a pleasant landscape of green fields and orchards. It also provides an illustration, in concentrated form, of a characteristic aspect of the modern Balkan landscape: recently-built mansions, typically boasting elaborate water features, kitsch ornamental lions, extensions that are never quite finished, and in many cases a large black German-made car parked in the drive. Try to avoid being knocked down by these same cars in the chaotic traffic of central Novi Pazar - it takes a little while to adjust after the orderly pedestrianised streets of Kraljevo. Probably the most important sight near Novi Pazar is Sopoćani Monastery, 16km to the west. I didn't get to visit it myself, for the same reason as Studenica, so I'll have to quote the description from the Bradt Guide: "home to some of the greatest religious art in Europe and, many would agree, the highest achievement of all Serbian art". Novi Pazar has fairly frequent buses north to Kraljevo and Belgrade (5 hours); if you hit a gap in services you may save time by getting a bus to Raška first. There are also a few buses daily to Rozaje in Montenegro (2 hours) and to Kosovo. The timetable displayed at the bus station should be regarded with deep scepticism. There is no public transport to Sopoćani, so you will need to drive or take a taxi. Novi Pazar has several hotels and pensions, including the spectacularly ugly Hotel Vrbak on the main square, which may provoke gasps even from travellers used to the more grotesque excesses of Communist architecture. Užice is one of the largest cities in Western Serbia, a collection of high-rise concrete blocks in a bowl-shaped valley. To the west of the city the valley narrows, forcing the main road and rail routes to squeeze through a narrow gorge. This gorge is overlooked by the ruined fortress of Stari Užice. The citadel and the views from its walls are quite impressive, and in other places might be a tourist attraction, but in Užice seem to be almost ignored. There are several ways to get there, not marked but easy enough to figure out. South of Užice the countryside becomes increasingly attractive. Zlatibor is a region of rolling hills, small villages, open pastures, and stately trees. The main settlement has something of an identity crisis - the Socialist-era name of Partizanske Vode has been replaced by Kraljeve Vode, but in practice it seems to be generally known simply as Zlatibor. It's a fairly large mountain resort, popular with domestic tourists, and very evocative of the Socialist era with its workers' holiday complexes and hotels with names like "Jugopetrol". From here you can follow trails into the hills. The open terrain means that you don't need to expend too much energy to enjoy expansive views. The summit of Čuker (1359m) to the southeast is a good target - from the top a sea of mountain crests stretches south to the horizon. A number of other excursions are possible in this area, for example to the open air Village Museum at Sirogojno, or the Šargan-Eight narrow-gauge railway at Mokra Gora. Closer to the Montenegrin border, the unremarkable town of Prijepolje is the jumping-off point for visits to Mileševa Monastery, 6km away. The plain white exterior of the church is quite different from the monasteries mentioned previously, but the main attractions here are the frescos inside the church. These include possibly the most famous single work of art in Serbia, the enigmatic White Angel. Like so many monasteries, part of Mileševa's appeal is its location in a sheltered valley. A little further up the valley is a fortress that looks rather like Maglić - I didn't have time to find out whether it is accessible. Užice is an important transport hub for western Serbia, easily reached by either bus or train. Four fast and six slow trains pass through on the Belgrade-Bar rail line (3 hours from Belgrade). Zlatibor is served by more than 15 local buses from Užice (45 minutes). As it is located just off a main road there are also quite a few long-distance buses to Belgrade and other parts of Serbia and Montenegro. There is a train station called Zlatibor but it is in a rather isolated location and is unlikely to be useful to most visitors. To get to Mileševa Monastery you first need to get to Prijepolje, which is also on the Belgrade-Bar railway - there are four fast and eight slow services daily from Užice (1.5 hours), several of which continue to Montenegro. From Prijepolje it takes about an hour to walk to the monastery. As it's a fairly dull walk you might prefer to look for a taxi, at least for the uphill leg. There are a couple of hotels in Užice, but there is a much wider range of accommodation in Zlatibor and the nearby villages.